Ernesto Tatafiore (Marigliano, 1943) was awarded a degree in medicine, specialized in psychiatry, and worked as both a physician and an artist at the same time. In 1969, on the occasion of his first solo show at the Modern Art Agency in Naples, he presented the paper shapes of trousers, shirts and chairs, while from the early 1970s he realized large-scale installations in which the canvases invaded the exhibition space as well. In 1977 he made his first iron sculptures, which were extremely minimalist and strongly symbolic, where the number one often appeared upside down, the stylized form of the guillotine. History and Philosophy became the major themes of his work, or else pretexts, through which the artist assembled a vocabulary consisting of figures made with a sharp line and colors without shading, imposing on them a continuous semantic overflowing that wavered between his personal story and a universal one, with subtle and energetic nuances of irony. This continuous tension supports the research that Achille Bonito Oliva has described as “Neo-Illuministic,” aimed at exploring the ethical link between art and history, in an ethical and civil commitment where memory and life, present and past are interlaced. As part of the gallery of Lucio Amelio, in 1980 Tatafiore participated in Aperto ’80 for the Venice Biennale and, by developing a pictorial language in harmony with the poetics of the Transavanguardia movement, he showed his work at some of the major international events in those years. One of the iconographic constants that can be traced in Tatafiore’s work is the female figure, which takes on a privileged role, the embodiment of History, Virtue, Religion. His first works on the French Revolution and its legends are dated to the 1980s: Robespierre, Marat, the Dea Ragione, the Ghigliottina, Maria Antonietta. Robespierre, the figure for whom the sculpture in the collection has been named, was chosen as the emblem of the eternal conflict and the exasperation of virtue, a subject capable of emphasizing the contradictions between political ideals and human emotions. Proverbs, word games, phrases and paradoxes appear in the artist’s paintings, commenting on the existence of forms that, over the years have been enriched with iconographic references. 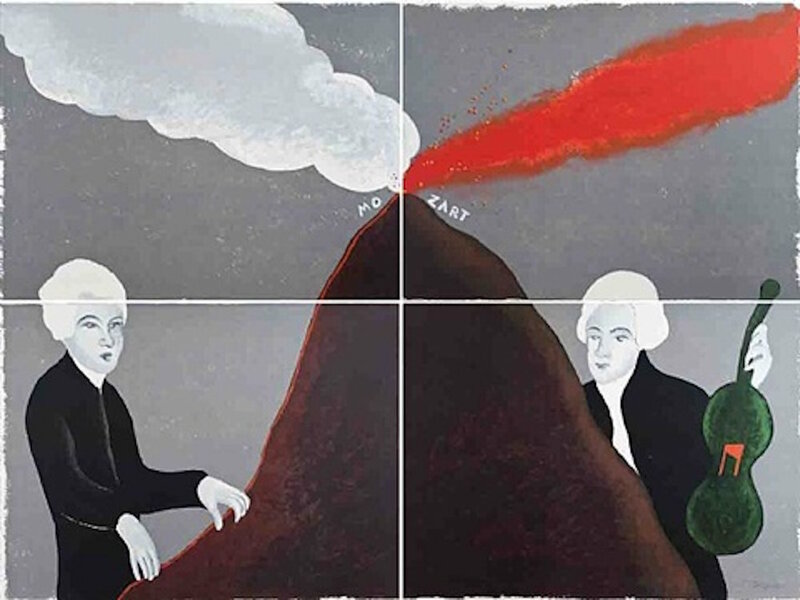 Numerous references are also drawn from the Parthenopean culture – Masaniello, Maradona, the Sirene, the Vesuvio, the iconography of the painting in the collection entitled Pittore di fuoco (“Painter of Fire”) (1985).